It’s natural to feel angry when children misbehave. However when we respond with harsh words and consequences, the children’s focus turns to our response instead of their poor choices. While responding to your child with anger will usually stop the behavior in the short term, it damages your relationship and does a poor job of preventing the same behavior in the future. The more serious the misbehavior, the more you need to figure out and fix the underlying problem. 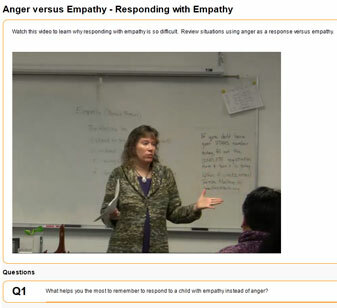 If you're interested in understanding how empathy can be used to find real solutions to problem behaviors, check out the new online class "Anger and Consequences Versus Empathy and Solutions". Child care providers and preschool teachers may take this class to receive two credit hours of continuing education.